This page allows you to exclude files / folders from the sync. 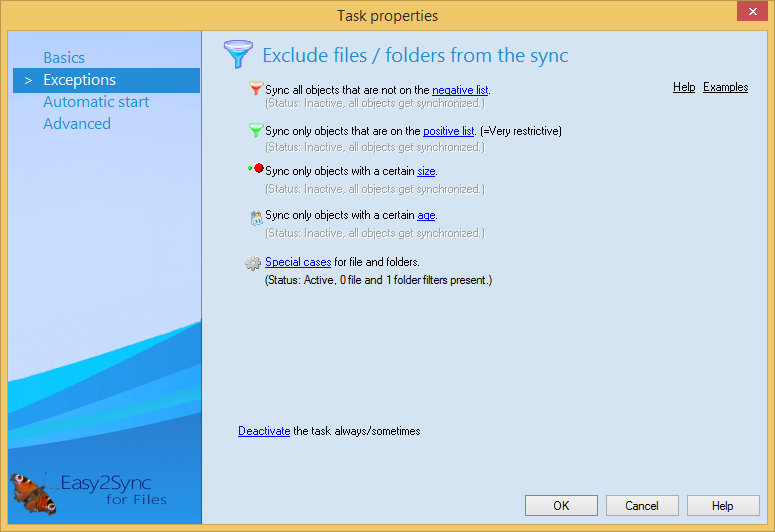 Easy2Sync will completely ignore excluded files. They allow you exclude files by their file suffixes or so-called "Wildcards" (like e.g., "test*") . Negative lists work (as the name says) negatively. This means that files / directories that are listed here will not be synchronized. Positive lists work just the other way round. Only files / directories, that are listed here, will be synchronized. All others will be ignored. Allows you to exclude files according to their size. Allows you to exclude files according to their age/date. Finally you may disable the entire task from the synchronization. You might do this for example if you currently don’t use this task and don’t want to start it by accident. Furthermore, you may let Easy2Sync activate this task only, if your computer is using a certain hardware profile, for example for a laptop with docking station. You can also enter multiple profile names if you separate them with a semicolon (";").